Aliomanu and Anahola are located at the north end of the east coast (Kapaa) of Kauai. Anahola is known for its bay. Anahola Bay is a great spot for swimming, snorkeling, body surfing, body boarding and surfing. On the right of the bay is a sheltered area great for the island “keiki” or children. Anahola bay boasts a sand bottom beach with views of the Kalalea mountain range. Kalalea is the majestic mountain range shown in the movie “King Kong” and many people believe to see the Kong gorilla head in the range. 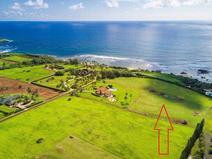 As a lot of the property in Anahola is owned by Hawaiian Home Lands, and leased to native Hawaiians, it is known for it’s large ethnic Hawaiian population. The Hawaiian culture, heritage and people are thriving in this area. Aliomanu is a quiet rural beach community north of Anahola. 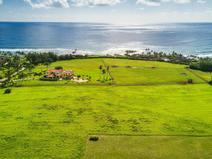 Only some beach and mountain areas of homes and land in Anahola, coastal homes in Aliomanu as well as larger estates in Aliomanu Estates (Papa’a Bay area) are available for sale to the general public. But if you are lucky enough to find a place to live here you will probably never want to leave this island beach community.